This post is “work in progress”. Last updated on the 28th April 2013, 21:00 Any comments are most welcome. And We (God) created man from a quintessence (gentle extraction) of clay. We then placed him as a nutfah (drop) in a place of settlement, firmly fixed (i.e. the womb). Then We made the drop into an ‘alaqah (clinging form), and then We changed the clinging form into a mudghah (chewed-like form), then We made out of that chewed-like form, izam (skeleton, bones), then We clothed the bones with lahm (muscles, flesh), then We (ansha’ nahu), caused him to grow and come into being and attain the definitive (human) form. Blessed be God, the Perfect creator. This article briefly describes the Izam (skeleton, bones) and Lahm (muscles, flesh) stages of development. The stage of development after the chewed-like form (mudghah) is referred to as izam which means “bones” (3) and the fetus does indeed acquire a cartilaginous skeleton of bones. In the 6th week the cartilaginous skeleton begins to form and the embryo acquires a soft skeleton as we see in Figure 2. Mesenchymal bones are made out of connective tissue which become cartilaginous, and then they become ossified and become (solid) bones. Mesenchymal bones form during the fifth week as condensations of mesenchyme appear in the limb buds (Figure 3 A to C). During the sixth week, the mesenchymal bone models in the limbs undergo chondrification to form hyaline cartilage bone models as wee see in Figure 3 D and E.
Figure 3 A, Photograph of an embryo at approximately 28 days showing the early appearance of the limb buds. B, Longitudinal section through an upper limb bud showing the apical ectodermal ridge, which has an inductive influence on the mesenchyme in the limb bud. This ridge promotes growth of the mesenchyme and appears to give it the ability to form specific cartilaginous elements. C, Similar sketch of an upper limb bud at approximately 33 days showing the mesenchymal primordia of the forearm bones. The digital rays are mesenchymal condensations that undergo chondrification and ossification to form the bones of the hand. D, Upper limb at 6 weeks showing the cartilage models of the bones. E, Later in the sixth week showing the completed cartilaginous models of the bones of the upper limb. (The Developing Human Clinically Oriented Embryology 9th edition, by Moore et al). 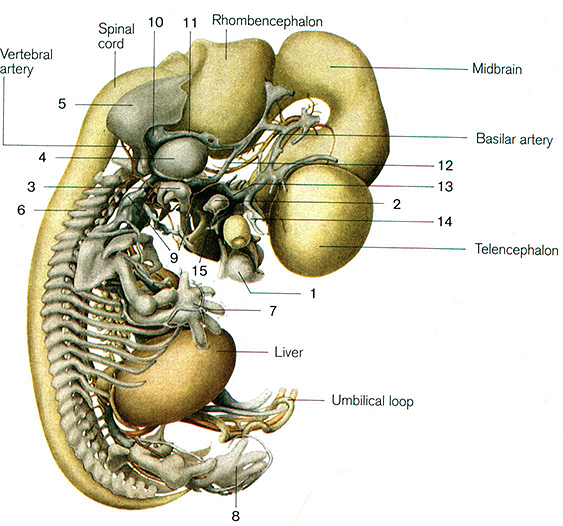 The formation of the skeleton gives the embryo its human shape. The next stage is the lahm stage (muscles, flesh) stage. The lahm stage is characterized by clothing the bones with muscles (al-kisa’ billahmn). During the lahm stage, the embryo develops human features, and the various organs assume their proper positions and are better proportioned. Thus during this stage the effect on the embryo of muscles clothing the bones is manifest in its external appearance. “Although precursor cells (myoblasts, or primitive muscle cells) are present adjacent to developing bone, differentiation into skeletal muscle attachments occur after the ossification process in the shaft and ends of the bones has begun. 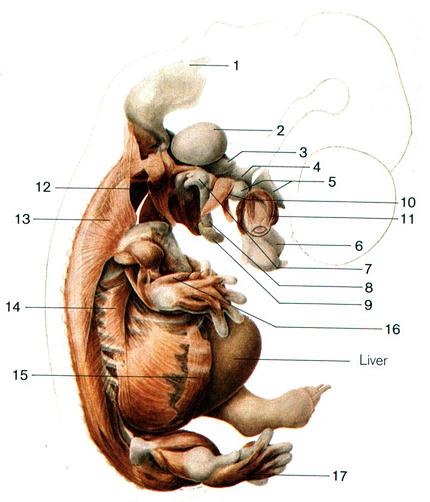 Figure 5: Human embryo at Stage 20 showing the skeletal musculature. About days 50-51 days (Ulrich Drews, Color Atlas of Embryology). (2) The lahm stage is characterized by “clothing the bones with muscles” (al-kisa’ billahmn). The Lahm stage begins from the about the end of the 7th week to the end of the 8th week and comes immediately after the izam stage. Figure 2 and Figure 5 show a human embryo at Stage 20 (about days 50 – 51 days) showing the cartilage skeleton and skeletal musculature. (2) For further information on bone and muscle development see Embryology in the Qur’an: Bone and Muscle Development (4). Wyganowska-Świątkowska M, Przystańska A. The Meckel’s cartilage in human embryonic and early fetal periods. Anat Sci Int. 2011 Jun;86(2):98-107. doi:10.1007/s12565-010-0093-3. Epub 2010 Aug 27. PubMed PMID: 20799009. (1) The Multi-Dimensional Human Embryo, Stage 20, Day 50. (2) Ulrich Drews, Color Atlas of Embryology, Thieme Medical Publishers, 1995. Page 98-99. Showing the cartilaginous skeleton of an embryo at stage 20 (about day 50 – 51, 18 – 22 mm). (3) Izam meaning “skeleton, bones”. The term encompasses both cartilage and ossified (hard) bone. This post refers to the development of the appendicular skeleton which consists of the pectoral and pelvic girdles and the limb bones. (5) John Allan and Beverley Kramer, The Fundamentals of Human Embryology. 2nd Edition. Wits University Press. 2010, page 148. (6) C.P. Wendell Smith and P.L. Williams, Basic Human Embryology, 3rd Edition, London, Pitman Publishing Ltd., 1984, p. 114. Right; so how could PZ Myers simplistically claim that the two processes occur simultaneously and, worse still, how could Adnan Rashid have agreed by claiming that the Qur’an supports both processes occurring sequentially and simultaneously?! To the contrary, PZ Myers et al., must contradict the Qur’an even to the point of denying the evidences. If a Muslim was to point out to sunbathing militant atheists like Myers that the sun is shining down in the bright blue sky, they’d deny that too just to contradict the Muslim! Some people have misunderstood what Moore has written and lectured about. From my limited understanding, the skeleton first appears as cartilage bone models. 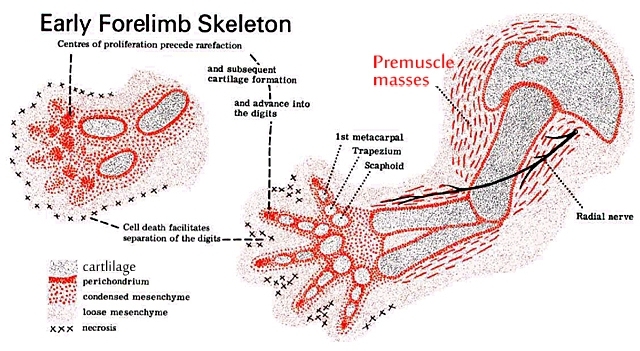 See https://islampapers.com/2012/04/01/bone-and-muscle-2/ and view the illustrations. Muscles then attach to bony structures (ossified bone) – which means that some ossified bone must be present for the muscles to attach to? When Moore talks about bone, some misunderstand and only think of hard (ossified) bone. “Bone” can also be soft (cartilage) bone too. Even in the English language we can talk of fish bone and chicken bone. Well, that makes logical sense to me. Mash’allah very impressed with your work brothers, may Allah reward you with good. PZ Myers is correct that the processes occur in parallel. Formation of cartilage models, muscle and bone happen over an extended, overlapping period. Both the start of chondrification and grouping of myoblasts occur in a proximal-distal order in the limb. Yes, the myoblasts aggregate into 2 distinct groups as chondrification (differentiation into cartilage of the condensed mesenchymal core in the limb) is beginning, but these cells that fuse to become muscle had already migrated into the limb (day 26) and around the condensing mesynchyme in a proximal-distal order before chondrification begins in the upper part of the limb (day 37) and lower part of the limb (day 41). You need to read a more detailed account to see this than the above quotes. See Galjaard, R.J.H 2003. Mapping Studies of Congenital Limb Anomalies. Page 16 (can be read as a pdf at http://repub.eur.nl/res/pub/10474/030924_Galjaard,%20Robert-Jan%20Harmen.pdf). Read carefully, this more detailed account doesn’t contradict the quotes in the above article. Note also that merely the start of chondrification does not mean that the cartilage models have yet formed such that you could reasonably say bones have formed. All this is in contrast to an Muslim debater who a year ago wrote a paper (after an encounter with PZ Myers) that took certain ambiguous quotes to incorrectly claim that the precursor muscle cell migration (not aggregation) along the limb happens after the cartilage models have formed so that he could vaguely claim it to be a process of “clothing” after bones have formed. But Somitic, you’ve missed the forest for the trees. The reason why I said P.Z. Myers claim was “simplistic”, and not untrue in the absolute sense, was because of the overall import of his assertion, which, of course, was to contradict the claim made in the Qur’an that the bones were formed first in order for the skin to clothe them. Unlike what some of his fellows have acknowledged in their more honest and nuanced evaluation of this subject (as cited in the above article), P.Z. Myers decided to adopt an absolutist position in this regard. His blanket claim gives the impression that the entire process occurs simultaneously when it clearly does not; there was more to this than meets the eye, and as an expert who presumably knows his field he should have known this and, therefore, should not have made such a simplistic assertion. I would hazard a guess and say that the reason why he made this rigid and inflexible remark was probably because of the modus operandi of most militant atheists of wanting to contradict the Qur’an and seek to defeat the Muslims hook or by crook to the point of absurdity. One GOD, Allah-Creator and Quran is HIS last divine Revelation. This is a clear PROOF that the QUR’AN is from The CREATOR of Man! Very interesting paper, especially to the musculoskeletal topic which I teach.